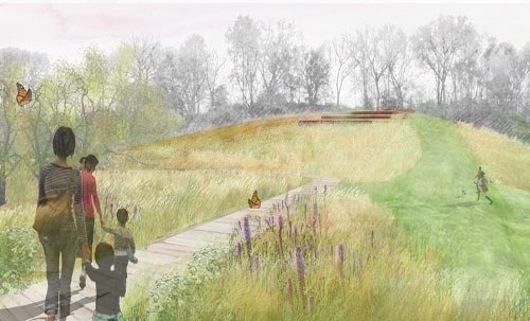 Frogtown Farm is a planned public park in St. Paul, MN that combines productive, recreational and reflective landscape programs in a neighborhood underserved by public open spaces. The plan focuses on human health - through the fresh produce grown on the 5-acre farm and the fresh food grown in backyards of residents trained on the farm; through exercise opportunities; and the mental health benefits of relaxing in natural environs. The plan also focuses on the long-term health of the community - positing that a unique and well-loved public space can make the neighborhood stronger and more stable.